Yesterday’s New York Times featured an interview with doctor-patient communication expert and Cambridge author Anthony Back (When Patients Feel Abandoned by Doctors, March 12). Back is concerned about the way doctors are taught in general, and that communication in particular is under-taught, especially when dealing with seriously ill patients. For physicians in training, learning communication is usually taken for granted—what I’d call learning by osmosis. The reality is that communication is a skill that one learns through practice, feedback, and reflection. It’s a skill that requires mentorship from someone who can provide careful observation and a kind of guidance that facilitates change. 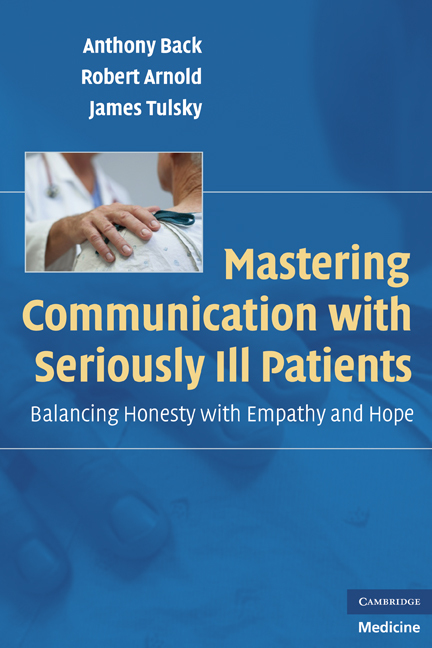 I have a hunch that one reason physicians hesitate to think about communication as a learned skill is that they’ve been ‘taught’ mostly by being shamed. For example, oncologists cite ‘traumatic experiences’ as more influential in learning communication than any other kind of educational experience—more powerful than role models, workshops, lectures, you name it. What the evidence shows is that osmosis is not enough; experience alone does not result in improvement. Patients and family members of course have a different view. They see communication as the lifeline of their experience with a physician. One family member wrote me just yesterday after reading about a study we did describing how patients could feel abandoned at the end of life. “I experienced exactly what you described,” wrote a husband whose wife died of CLL. This is the kind of story (which I’m using with the permission of the author) that led to our book. We think physicians can do better, and that they actually want to do better—they just never learned how. A tip for working with patients you’re referring to hospice: Give them a routine followup appointment in 2 or 3 weeks. Tell them that you want to make sure they are doing okay, and also that they can cancel it. That is a way of telling them (and showing them) that you are still going to be involved.